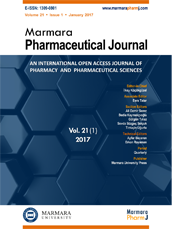 It is with great excitement that the Editorial Board of Marmara Pharmaceutical Journal (ISSN : 1309-0801) wishes to inform you of our recent decision to change our name to Journal of Research in Pharmacy. The decision was made for the reason to furhter increase international representation and recognition of our journal. Due to our journal’s decision to change its name to Journal of Research in Pharmacy, our manuscript template and copyright transfer agreement has been renewed. Synthesis, characterization and antitubercular evaluation of some new isoxazole appended 1-carboxamido-4,5-dihydro-1H-pyrazoles. Anti-inflammatory properties of the ruthenium polypyridyl complex, K314, on the in vitro activated macrophages. The development of forced degradation studies for the determination of daptomycin in urine at various conditions by using RP-LC method. Spectrophotometry, potentiometry and HPLC in determination of acidity constant for cabergoline and tadalafil. Antioxidant and anti-inflammatory potentials of Solanum pubescens Willd an ethnomedicinal plant of South Western Andhra Pradesh, India. Analgesic, anti-inflammatory and anti-pyretic activities of methanolic extract of Cordyline fruticosa (L.) A. Chev. leaves. Elucidation of biological properties of some commercial anthraquinones: Mutagenic / antimutagenic and antimicrobial activity approaches. Oxoaporphine alkaloids from the barks of Platymitra siamensis Craib (Annonaceae) and their cytotoxicity against MCF-7 cancer cell line. Zingiber officinale mitigates diazinon-induced testicular toxicity via suppression of oxidative stress and apoptosis in mice model. Effect of aerial part and root extracts from Ferulago mughlae Peșmen and Ferulago sandrasica Peșmen & Quézel growing in Turkey on erectile dysfunction in streptozotocin-induced diabetic rats. Water fraction of Sonchus arvensis (Linn.) leaves protects heart upon isoproterenol-induced myocardial infarction in rats and promotes survival of cardiomyocytes in vitro. Blood pressure lowering effect of scopoletin on oxidative stress-associated hypertensive rats. Scylla serrata Forskal as natural source of glucosamine hydrochloride. Modeling to predict the cytotoxicity of SiO2 and TiO2 nanoparticles. The influence of melatonin supplementation against aluminum-induced toxicity in brains of male rats. Peruvian pharmacist employment and wage: Gender, university and type of job influences. The percentage of depressive symptoms in patients with type 2 Diabetes Mellitus in M Djamil General Hospital Padang, Indonesia. Patient counseling, risk factors and comorbidity assessment in diabetic foot ulcer. Comorbidities and its relation to performance status and estimated survival rate among cancer patients. Dissolution enhancement and physicochemical characterization of fenofibric acid in surface solid dispersion with croscarmellose sodium. In vitro bioavailability studies on phytochemical profile and antioxidant activity potential of Clematis viticella L.. Biological activity and chemical composition of the essential oil of Nepeta cataria L..